It’s a blessing to be with you all on this Christmas morning, with family and friends from all over! However, 2,000 years ago, a young couple from Nazareth had no other family or friends nearby to support them as the time came to deliver their child. God himself was born into a household surrounded by barn animals and straw. Instead of being surrounded by family and friends, shepherds came by with their rags and less than beautiful sheep. 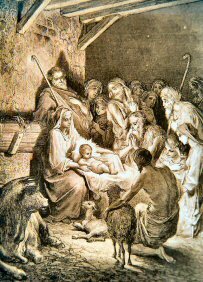 The Almighty was born for us …and no one even knew it, except a few lowly shepherds! God’s coming among us was completely beyond our expectations or imaginings – the passage we just heard from John’s Gospel reflects how amazing this event was. Instead of painting the traditional Nativity Story that we all know from Matthew and Luke, John composes more of a poem, about the Word which is God. What are we to take from this? Said the night wind to the little lamb, do you see what I see? Way up in the sky little lamb, do you see what I see? A Star, a star, dancing in the night; with a tail as big as a kite, with a tail as big as a kite. Said the little lamb to the shepherd boy, do you hear what I hear? Ringing through the sky shepherd boy, do you hear what I hear? A song, a song, high above the trees; with a voice as big as the sea, with a voice as big as the sea. Said the shepherd boy to the might king, do you know what I know? In your palace walls O might king, do you know what I know? A child, a child, shivers in the cold, let us bring him silver and gold, let us bring him silver and gold. Said the king to the people everywhere, Listen to what I say! Pray for peace people everywhere, Listen to what I say! A child, a child, sleeping in the night, He will bring us goodness and light, he will bring us goodness and light. The Word became man, so that He could bring us goodness and light! In the quiet peace of night, the font and source of all peace has been born, the Son of God himself has entered our time. Before, God spoke through His messengers – now He speaks to us directly, through His Son, because His Son is one of us now. Thanks be to God for John’s Gospel, for in it, we see the wondrous beauty and meaning behind the Nativity Scenes painted on Christmas cards and in our homes. In it we see how God has sent his only Son, who is light and life, into a world that suffers from darkness and death. Why would God send us His son, if not for the fact that the fact that He desires a new relationship with us? Here in our church, the Word that existed from the beginning, the Word that is God, is still proclaimed every day here at this pulpit. At this altar at every Mass, the Word is made Flesh, the Son of God comes to us in his humanity, sacramentally present in the Holy Eucharist, so that we can be united with Him in Holy Communion. You won’t find such a Christmas gift anywhere else… a Christmas gift which is given, every Sunday of the year! And that’s not all. In the beginning was the Word, and the Word was made Flesh… and Dwelt among us. God as man, Jesus Himself, dwells among us still in every tabernacle around the world. When we come to Church to pray, we are before the same person who slept in a manger, the same person who changed bread and wine into his body and blood, the same person who hung and died on a cross for us, now present in the tabernacle, for us. Christ became man to save us from darkness and death, thus essentially restoring friendship between God and man. He started out small, so he could fit into our own hearts and make them ever larger like His own. Because Jesus became man, man can be united again with Jesus’ Father, now our Father. The Son of God became man, so that man could become a Son of God and we have only begun to realize this! This is a friendship that never dies, this is indeed a friendship that transforms us at our deepest core and makes us Sons and Daughters of God. This is why, according to John’s Gospel, the Word was Made Flesh – we are now children of the Almighty, thanks to the babe lying in the manger. So, on this day we celebrate the birthday of a friend unlike any other we have ever had or will ever have. He was born into the cold of night to illuminate our darkness and save us from death, by His own suffering and death on the cross. A Dundon Family Christmas movie favorite helps to illustrate this amazing friendship, a movie with a much older Jimmy Stewart, who plays an elderly and day-dreaming custodian of an apartment building. In one of his daydreams he’s imagining that he’s in Bethlehem at the birth of Jesus. He approaches the manger, and upon recognizing Christ before him, he fumbles with words, yet manages to exclaim, “You’re my closest, my finest friend. And that means that I can hold my head high, wherever I go. Thank you. Thank you. Thank you.” So, when we behold Jesus in the manger, when we receive Him in Holy Communion, when we sing our Christmas carols with family and friends, may our hearts on this wondrous day sing out with two words – Thank you, Thank you.